There are millions of startup ideas that fail. In fact there are 10X more ideas that fail than succeed. You may have heard the statistic that 9 out of 10 new companies fail [ref]. How is this possible? It really is impossible to believe that there are 10X more failures than successes. How can this be true? It’s because we mostly hear about successes, and rarely about failures. Look around you wherever you are sitting right now. You are surrounded by products, by brands, by companies. But these are all successful companies. The fact that you can see their product in your space means that the company succeeded at some level. At the same time you are NOT surrounded by the 10X more products that failed, because they failed. All of the failures are invisible to you, even though they far outnumber the successes. This phenomenon in human thinking has a name. It is called survivor bias. If you go to your uncle’s house, and he has a 50 year old refrigerator, and he wraps his arm lovingly around it and says, “They don’t make ’em like they used to, no siree!”, this is survivor bias. Your uncle is ignoring the millions of 50-year-old refrigerators that died and went to the junk yard, because he can not see them. They are completely forgotten. He only sees the one surviving refrigerator in front of him and praises it. Try it yourself, right now! Look at what is being posted there. It is super-simple. People post a single photo of something mildly interesting, along with a short, descriptive little title. That’s it. Notice, as you look at the top posts in the MildlyInteresting subreddit, that it seems incredibly, unbelievably, insanely simple to get something to the top of this page, and thus to the front page of Reddit as a whole. 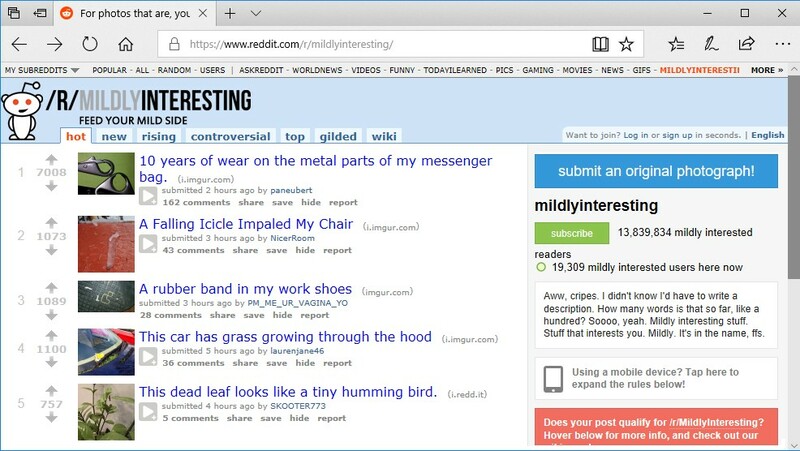 The MildlyInteresting subreddit has millions of subscribers. Really, you should give it a try, because you will learn something incredibly important. Even though it looks dead simple to post something popular on the MildlyInteresting subreddit, and therefore reach the front page of Reddit, it is in fact incredibly difficult. Why? Because of survivor bias. When you look at the Reddit home page, you are only seeing the small number of posts that succeed. You are ignoring the millions of posts that crashed and burned – that only receive 10 or 100 upvotes and then died. I’ll post something and it will be on the front page of Reddit! I’ll move to LA and become a famous actor/actress! I’ll practice hard and become a famous player in the NBA/NFL/etc. I’ll start a band and record a Top-40 hit song! I’ll write a best selling book! I’ll create a web site that gets a lot of traffic! I’ll create a YouTube channel like PewDiePie with 50 million subscribers! I’ll create a restaurant that doesn’t go out of business! All of these things really can and do happen – there really are players in the NBA. But the number of NBA players is tiny – only about 3,000 players total over the last 50 years [ref]. Therefore, while all of these things look/sound easy to the uninitiated, they are in actuality rare events. The reason they look/sound easy is because of survivor bias. All we see are the successes, and few or none of the 10X more failures, so it looks easy. As an entrepreneur you have to wrap your head around survivor bias and grok what it means for you. You are going to come up with entrepreneurial ideas, and the reality of our world is that some of them will resonate and some of them will not. This is how the world works, and this is why IPESSI has the E for Evaluation. You have to be able to objectively look at an idea and decide if it is resonating or not.